1. Having a free back and hip massage, Making you feel relaxed during working or intensely gaming period with the thick padding. 2. Having a nice dream when you take a quick nap with the tilting chair back. 3. Having more confidence whatever you are tall or with about 280lbs loading capacity. 4. Enjoying the praise of Fantastic Chair. Whatever using as office executive computer desk chair, home desk chair or gaming racing chair, Coavas computer chair is yours Mr or Mrs RIGHT. *Function: can used as home computer desk chair, gaming racing chair, also can be office executive leather computer chair. gaming chair❤️---MATERIAL: PU Leather around chair including armrest, easy to clean and also good for skin. Thick padding back,seat and arm rest can provide you an extremely comfortable seating. gaming chair❤️---LOADING CAPACITY: 280Ibs. Seating area dimension: 26.4*9.7inch, adjustable height: 42.1-45.7inch. gaming chair❤️---FUNCTION: The whole chair can rocked back and forth, which is not only suitable for napping and seating during busy working days, but also can offer a wonderful experience in intense gaming moment. 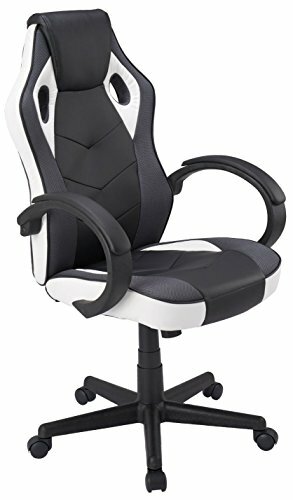 racing chair❤️--USAGE: can used as home computer desk chair, gaming racing chair, also can be office executive leather computer chair, boss/task/manager chair. racing chair❤️--- WARRANTY: within 30 days no reason to return the package. Any quality or transportation problem, can promise you will be get a satisfy answer from us.